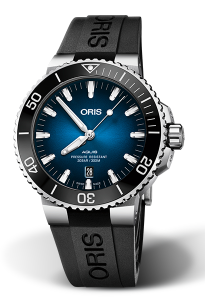 43.5mm, stainless steel case, sapphire crystal with date, screw down crown, and automatic movement. This case back is etched with an image of the Clipperton Island. Available on a sporty, black rubber strap, and folding stainless steel clasp.